With huddles of buildings built from the wool textile prosperity of the late Middle Ages; Sudbury is home to many pockets of time. Three historic parish churches lay testament to the wealth and creativity of the town, joining narrow streets of jetty buildings, dark wooden beams and tracery windows. Cornered by Gainsborough Street and Weavers Lane is the former home of the painter Thomas Gainsborough, now a museum and gallery dedicated to his works. The Georgian brick façade gives way to a Tudor warren of rooms containing fluid charcoal studies, highly detailed etchings and the conversational landscapes and fine portraits for which he is famed. The gangly Mulberry tree in the tranquil country garden bridges the home that Gainsborough would have recognised and the present day museum and gallery. This Mulberry tree dates back to James I, who tried to bring silk production to Britain but wrongly introduced the ‘black’ fruit baring Mulberry rather than the ‘white’ variety, favoured by hungry silk worms. Sudbury’s second textile life, after wool, came not as a silk producer but as Britain’s most important centre for silk manufacture. This history is being explored in the current display at Gainsborough’s House; ‘Silk: From Spitalfield’s to Sudbury’ (17 June – 8 October 2017). Spitalfields, London is well associated with silk manufacturing in Britain, at its height containing up to 6000 active weavers in two square miles. This included James Leman (1688 – 1745) and Anna Maria Garthwaite (1690 – 1763), whose workings are exampled in the exhibition. On display are beautiful floral and bazaar watercolour designs, highly representative of the detailed tissues and brocades being woven at the time. The fabrics were rich in silk lustre and colour, highly desired by London’s elite. Woven examples can be seen in the loan objects on show; a women’s brocaded shoe and a 1760’s dress silk panel. Despite the increasing popularity of silk the implementation of the Spitalfields Act of 1773 eventually drove the weaving trade away from local magistrate wage controls and outside the borders of their jurisdiction to the Essex/Suffolk border. Here weavers found that they had more freedom over their business but could still access the important trading centre of the City of London. The Huguenot weaving dynasties of Vanners brothers (est. 1740) and Stephen Walters & Sons (est. 1720) moved to Sudbury in the mid-nineteenth century and were later joined by Gainsborough Silk Weavers (est. 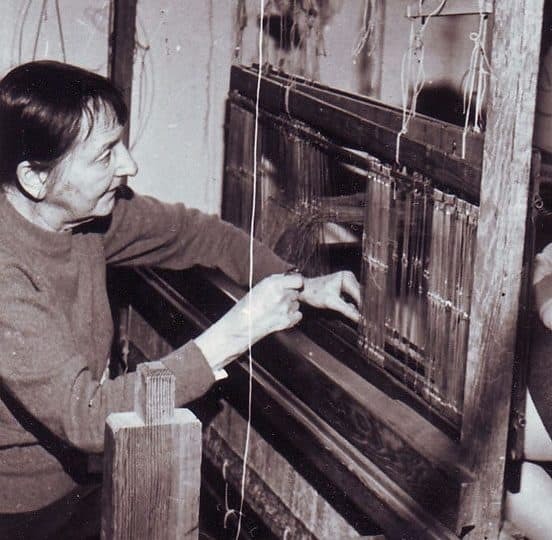 1903) and our own Humphries Weaving (1972). The second part of the exhibition displays work from these remaining, and thriving, Sudbury Silk manufacturers. Sudbury produces nearly 95 percent of the nation’s woven silk textiles and in 2015 ‘Sudbury Silk’ was awarded protected geographical status; such is the importance of protecting its heritage and true origin. Sudbury Silk is desired the world over by couture fashion houses and for the finest interiors, of which examples are framed on display. Humphries Weaving were pleased to loan two fabrics for the exhibition. The ‘Pannier Damask’, woven for the Blue Drawing Room at Buckingham Palace in the time of Queen Mary. Secondly the ‘Hatfield Damask’ a pattern attributed to the Spitalfields weaver James Leman. Working with the deepest respect for its ancient trade, Humphries Weaving combines historical knowledge with innovative weaving techniques of today to produce impeccable fabric for Royal residences, historic properties and luxury private homes.